We are a family of four people, four lovely dogs and two cats. 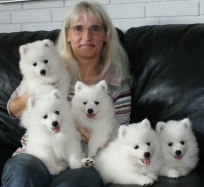 My husband, our two sons, age 20 and 14, and I, got our first Japanese Spitz Sheila in 2008 and Bailey in 2009. In 2011 Balou was born here and is now at my mom’s. In 2012 Maggie was brought home to us from Sweden, and in 2015 we got Mayzie from Finland. We live in a house close to the woods and not far from the beach, where we take many wonderful walks with the dogs. We have a small kennel where the puppies grow up in the middle of the family. We have had eight litters. We are very cautious about making breed typical, beautiful, strong and happy dogs. We choose the male dog for our girls with great care, and for us the dogs’ well-being is very important. Our breeding is under Danish Kennel Club and we will always follow there and the special spitz club’s rules. The puppies will be sold with Danish Kennel Club buying contract. My oldest son and I goes to dog shows with the dogs, which always is an exciting and comfortable experience.